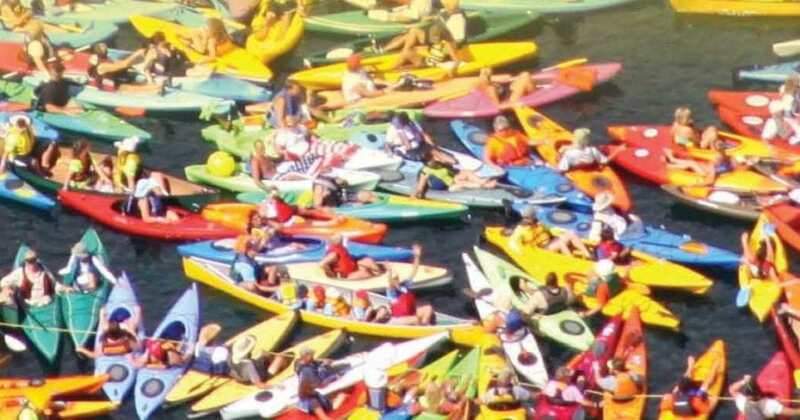 SUTTONS BAY: On Saturday, September 5, 2015 in Suttons Bay there will be a big Northern Michigan event that combines paddling and community— an attempt to reclaim the Guinness World Record for the biggest number of kayaks and canoes rafted together. In 2013, Suttons Bay Public Schools claimed the record by floating 2,099 vessels, connected and rafted together only by the hands of the participants, breaking the previous record of 1,902 vessels, set in 2011. In 2014, the prior record holder, a group in Inlet, NY, reclaimed the record with 3,150 kayaks and canoes. Floatilla 2015 will once again take place in Suttons Bay, with proceeds benefitting Big Brothers Big Sisters of Northwestern Michigan. For information or to register for this chance to make history, please go to www.sbfloatilla.com. While you’re in Suttons Bay for the floatilla make sure to check out restaurants, shops and more. Find them in the MyNorth Vacation Guide for Leelanau County!